Dust Explosion Tested at Auto Facility in San Antonio? Per DustSafetyScience.com, "Fire Crews Respond to Dust Explosion at Toyota Facility in San Antonio", on September 20, 2018, a paint vapor is cited as a cause of a dust explosion with in a paint scrubber system. Thankfully, no injuries were reported. Though they'd recently undergone a partial OSHA inspection, they'd not been cited for dust. On the same day, a scrap metal refinery in Whiting, Indiana reported a dust fire in a baghouse. Also, no injuries reported though firefighters fought bad smoke. Unfortunately, incidents of dust explosibity continue despite easy testing methods. It can start with a simple Go/No-Go Test. Very often, when performing dust and explosibility testing quotes for customers, we are asked what exactly a Go/No-Go test is? While we offer a list of testing services to determine the deflagration hazards of dust samples per ASTM (American Society of Testing and Materials), OSHA (Occupational Health & Safety Administration, NFPA (National Fire Protection Agency) and UN (United Nations), knowing what this basic test is can go a long way for tackling your safety needs. In the article: "How To Collect and Ship Combustible Dust Samples For Testing", we discuss the simple steps for getting your samples to a lab for testing. See above for our chart that depicts the outcomes for your dust tested. If your test sample is a "Yes, it explodes" then further tests can be run to determine how quickly and how severe the explosion will be (KSt/Pmax Test), followed by testing what concentration of dust in the air will cause a risk of explosion (MEC Test). 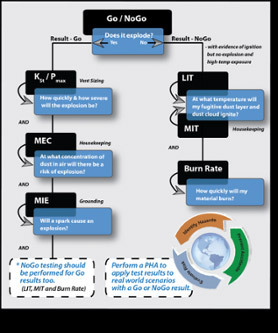 Next, another test can determine if a spark will cause an explosion (MIE) test. But, what if your Go/No-Go test result is a "no"? Well, we next look at what temperature it will take make your dust layer ignite. To find the Minimum Autoignition Temperature (MIT) of a dust cloud in the air, the MIT tests the minimum temperature that would cause your dust cloud to ignite. Next, is the LIT Test, which determines the hot-surface ignition temperature of dust layer. Finally, a Burn Rate test is conducted to determine how quickly the dust material will burn. All of these tests start with the Go/No-Go Test. A comprehensive DHA or Process Hazards Analysis (PHA) can apply your test results to real world scenarios at your facility. Better to know wha t you are dealing with so you can plan safely! In addition, if you have a dust collector and aren't sure what to do next, read: "Combustible Dust Made Easy". Unless otherwise instructed, dust testing is performed on the sample as it is received (“as received”) from your facility as mentioned earlier. It may be screened to less than 420 μm (40 mesh) – OSHA’s and NFPA’s demarcation of a “dust” – to facilitate dispersion into a dust cloud. Particle size may vary widely depending on the sample. Please note that per ASTM recommendations (and some NPFA requirements); samples should be tested at a particle size less than 75 μm and less than 5% moisture. Please also note that testing materials in a method not complying with the ASTM/EU recommendations may produce explosion severity and explosion sensitivity data that is not considered conservative enough for explosion mitigation design. Need more help with possible hazardous or combustible dust, vapors and gases? You can send materials to us or have our experts visit you for on-site services. We provide comprehensive process safety management (PSM) services. Contact us at 630-323-8750, info@fauske.com.